Alp works out of his garage, in Shadow Hills, Los Angeles. That’s a long way from Istanbul. Photo by Mark Gardiner. The prevailing dress and facial hair codes at SCTA events run somewhere on a spectrum between "Duck Dynasty" and ZZ Top. A lot of those old guys are running cars and bikes they’ve been developing for decades, since they were new. Only now they're running them in vintage classes. So even if Alp hadn’t showed up with a leggy fashion model as his crew chief, people probably would’ve noticed the new "furriner." They may also have noticed that he seemed to have built the fastest stock-framed Triumph Thunderbird in history. Alp hand-formed those stainless steel exhaust pipes by filling them with sand and heating them with an oxy-acetylene torch. Note the position of the clip-ons, below the bottom triple clamp. Even though he designed this bike for an unfaired class, it’s all about getting down out of the wind. Photo by Mark Gardiner. "Special construction" means it’s not a factory frame. Alp designed and fabricated the chassis himself, from chromoly tubing. It looks a bit like a vintage drag bike; too short, too light, and too lacking in rear suspension to fit in as a land speed racer. The rear hard-tail loop is as short as possible, with a member that actually penetrates the gearbox, which keeps the final drive short, too. 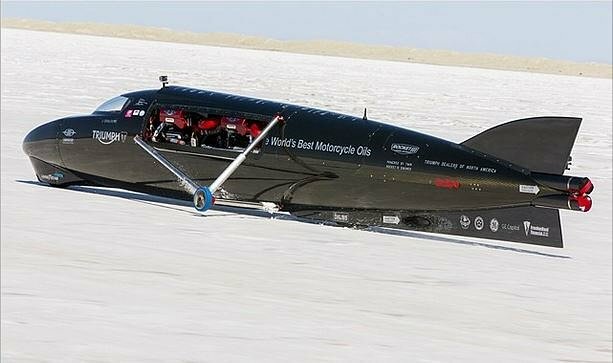 For his next trick, Alp wants to break into the 200 Club on a partial streamliner powered by one of his 650 cc pushrod twins. That would make him the first guy ever to go that fast on a "sit-on" motorcycle (as opposed to a full streamliner). He’s already sketched out the bodywork, which will be all aluminum he plans to hand-form himself.